Following the earthquake that struck Nepal on April 25, 2015, numerous pictures of the aftermath of the tragedy were shared on social media. 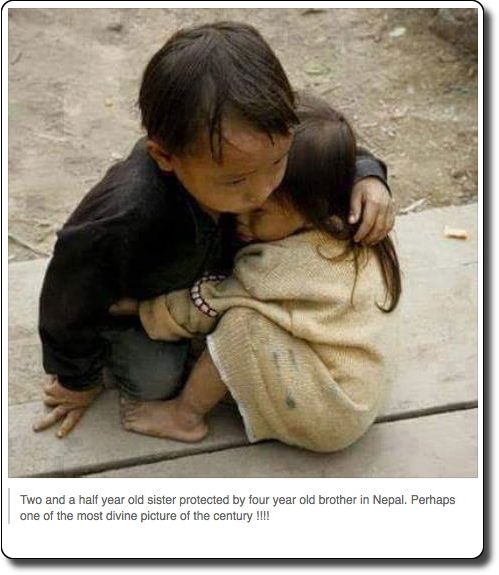 One of the most widely shared pictures was identified as a young boy in Nepal comforting his two-and-a-half year old sister. The photo does actually show a young boy comforting his sister. But it wasn't taken in Nepal in 2015. It was taken in Vietnam in October 2007 by photographer Na Son Nguyen. Na Son told the BBC News that he was in Can Ty, a remote village in Ha Giang province, when he came across the two children who were playing while their parents were working in the field. The girl started to cry, frightened by the presence of a stranger, and the boy reached out to comfort her. About three years later, Na Son noticed that the photo was going viral amongst Vietnamese Facebook users who were mistakenly describing it as a photo of "abandoned orphans." He tried to correct the misinformation, but to no avail. The photo was subsequently misidentified as showing "Burmese orphans" and "victims of the civil war in Syria." However, it reached the heights of its viral popularity after the Nepal earthquake when the two children were associated with that tragedy.